In “Medical Women in Fiction” (1893), Sophia Jex-Blake – one of Victorian Britain’s pioneering women doctors – catalogues and critiques her fictional counterparts. Focusing on a series of British and American novels published between the early 1870s and early 1890s, she declaims any interest in their “literary value” while nonetheless judging their realism. To what extent, she asks, are their portraits of medical women “taken from life”? Jex-Blake castigates those novels which depict women doctors as either “exceptionally weak” or “preternaturally robust and healthy” and scorns those which equate women’s interest in medicine with a romantic ‘disappointment’. Although she speaks positively of Henry James’s depiction of Dr Mary J. Prance in The Bostonians (1886), her highest praise is reserved for Mona Maclean, Medical Student (1892), a novel “manifestly written from the inside”. In Jex-Blake’s estimation, several scenes in the novel clearly demonstrate the author’s affinity with medical education and practice. She celebrates the book’s commitment to representing “several types” of medical woman, while specifically commending the realism of its heroine who, she contends, “stands before us absolutely alive, and with as distinctive idiosyncrasies as any friend of our own”. Although Jex-Blake suggests that the author’s skill is reminiscent of George Eliot, she later concludes that it is “probably not the work of an experienced novelist”. Instead she argues that “those who desire to meet the genuine medical woman, as presented by herself, or by a wonderfully sympathetic professional brother, may do so in these pages”. This is an enigmatic conclusion, with Jex-Blake clearly raising the possibility that the named author – Graham Travers – is merely a pseudonym, an affectation adopted by a medical man – or woman. Jex-Blake’s apparent ignorance as to Mona Maclean’s authorship was, in reality, an elaborate pretence. She was well-aware that the novel had been written by a young female medical student – one Margaret Todd – because that woman was both her student and companion. Todd was one of the first pupils at the Edinburgh School of Medicine for Women, which was founded by Jex-Blake in 1886. By 1892, when the novel was published, the pair had been living together for four years. Jex-Blake is widely considered the inspiration behind the novel’s depiction of medical women; Kristin Swenson traces the way in which her formative experiences influenced Todd’s treatment of the friendships between the young female medical students and suggests that her character is reflected in the stolid, forthright practitioner, Dr Alice Bateson. Further, Jex-Blake also helped to secure Mona Maclean’s publication deal with Blackwood’s. Thus, her apparently unbiased review in the pages of The Nineteenth Century was arguably a carefully constructed advertising campaign for a book she had a significant investment in. As two of the earliest women to qualify and practise medicine, it is perhaps unsurprising that Jex-Blake and Todd shared a close, even intimate, relationship. As has been well-documented, Jex-Blake played a seminal role in securing women’s access to medical education in Britain during the late 1860s. 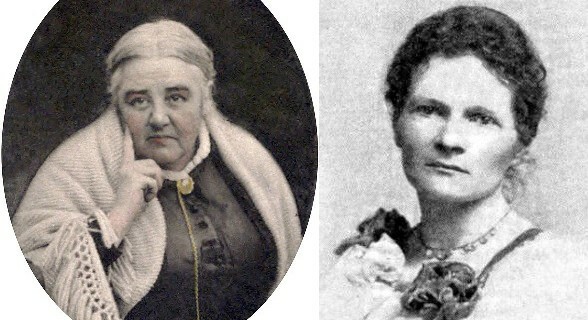 Although by this time there were two women on the Medical Register in the UK – Elizabeth Blackwell (the first woman doctor to graduate in the US) and Elizabeth Garrett Anderson (the first female doctor to qualify in England, though she was educated privately) – they both joined through exploiting ‘loopholes’ in the system and the profession effectively closed ranks to prevent other women following suit. Although Jex-Blake was initially successful in her efforts to secure a place for women medical students at the University of Edinburgh, the university court subsequently decreed that women could not be given medical degrees. She continued her battle – after completing her education in Switzerland – and in 1876 Britain passed legislation which allowed (though did not compel) medical schools to examine women. One of the earliest medical schools specifically designed for women was Jex-Blake’s institution in Edinburgh, where Todd studied while writing Mona Maclean. As its title suggests, Mona Maclean, Medical Student focuses on the adventures of a fledgling woman doctor though (surprisingly, perhaps) much of the action takes place while the heroine takes a break from her studies. The triple-decker opens with Mona discovering she has failed her Intermediate Examinations for the second time, much to the amazement of her peers, who consider her one of the brightest of their cohort. Experiencing the inevitable self-doubt, Mona holidays with her rich relatives the Munros before hiding out in Borrowness, Scotland, working in her cousin Rachel’s shop. The parochial Rachel is unconvinced by the propriety of women doctors and requests that Mona hide the fact she is a medical student from the local community. Much of the ensuing narrative is a gentle but compelling romantic comedy – propelled by plenty of dramatic irony – following Mona’ struggles to shield her true identity after she falls in love with an unsuspecting male doctor, Dr Dudley. The plotline sounds like fairly undemanding fluff and it is indeed light-hearted in tone, as its almost Enid Blyton-esque title suggests. Our plucky heroine unwittingly attracts myriad admirers – from the muscular romantic hero, “the Sahib”, to the more pitiful provincial draper/ amateur botanist, Mr Brown – and enjoys playful and spirited conversations with her female friends, including the pretty and flirtatious medical student Lucy Reynolds and the more serious-minded Doris Colquhoun, whose parents have denied her access to the career she longs to pursue. Time and time again the reader will roll his or her eyes as yet another character remarks how these young ladies manage to combine charm and good looks with intelligence and dogged determination. The frothy narrative comes to a suitably frothy head when (spoiler alert!) Mona finally passes her examinations and becomes a doctor, setting up both a home and a practice with her new husband, Dr Dudley. If it all sounds rather twee, however, it should be acknowledged that this ending was fairly radical given that most stories depicting medical women had them remain firmly outside of the marriage market or forsake their professional prospects in order to enter it. Jex-Blake’s contemporary review attests to this, as does more recent criticism by Swenson and Tabitha Sparks. Indeed, Sparks explicitly praises Mona Maclean for its “uniqueness” in reconciling the woman doctor to the Victorian marriage plot. Much of the novel also grapples with self-consciously ‘political’ arguments about the propriety of this new breed of women doctors. In particular, Mona must face the prejudice of her uncle, Sir Douglas Munro, who fears that – by pursuing a medical education – a woman “loses everything that makes womanhood fair and attractive”. She is able to mollify him chiefly by exploiting his distaste for male doctors practising on young women. Indeed, the suitability of women practitioners for women patients is a common refrain throughout the novel and a notion that Dr Dudley enthusiastically subscribes to. The novel is also interesting in the way in which it intertwines medical episodes with its love story, ensuring Mona’s personal and professional journeys are fully integrated. As Swenson argues, Mona Maclean is a “novel of education” in which the heroine must experience “love and familial responsibility” in order to learn about “human sympathy and compromise”. In essence, she must find a cause to guide and govern her intellect and ambition. Mona identifies the “turning-point” in her Bildungsroman as her night in Barntoun Wood, in which she cares for an unmarried mother and her premature baby, at the request of her love interest, Dr Dudley. Although he is still ignorant of her professional expertise, he entrusts Mona to take a leading role in the crisis and she excels both because of her practical knowledge and because of her more personal connection with the patient as a fellow woman. Medical practice and romance also coalesce at the novel’s denouement, which privileges the role of sympathy and compassion in the doctor/ patient encounter. The final image is of Mona and Dudley’s joint practice and of him handing over yet another vulnerable female patient to her care. As Swenson suggests, Mona Maclean seems a strikingly “optimistic” and “upbeat” treatment of the woman doctor. However, in Jex-Blake’s view this did not preclude realism. In her review, she argues that it has “all the charm and freshness of reality”, combining “sparkling wit and wisdom” in its portrait of young medical women. When Jex-Blake deems it “a delightful novel” there is no hint of condescension: for her, its optimism illustrates its sympathy for the cause and is a persuasive tool to convince the unconverted. Todd – who maintained both her medical and literary interests, working as Assistant Medical Officer at the Edinburgh Hospital and Dispensary for Women and Children, and penning further novels and short stories – would apply this same optimistic approach to the portrait of the woman doctor when it came to writing another story inspired by Sophia Jex-Blake: her mentor’s biography. Jex-Blake died in 1912 in Windydene, Rotherfield, where she had lived with Todd since her retirement. Six years later Todd’s biography of her – The Life of Dr Sophia Jex-Blake – emerged; a painstaking and hagiographic account of her remarkable life as a pioneer for women’s medical education and practice. As The Times opined in its obituary of Todd (she died three months after the book’s publication), although “authoritative and complete”, the biography is nevertheless “in parts almost too laboriously minute for the general reader”. Mona Maclean – with its faithful depiction of the woman medical student enmeshed with a playful comedy of manners – remains a much more readable and accessible introduction to early women doctors in Victorian Britain. Pictures courtesy of Wikipedia (Public Domain). This is great! I read all this stuff for my PhD (which was on the medical women of Edinburgh) and its lovely to read some fresh insights into the material. As far as i was aware Todd burned all Jex-Blake’s papers (thus the only detailed account of Jex Blake’s life and thoughts is the biography you mention, despite J-B’s prolific correspondence) and then took her own life. A tragic ending. Todd’s hagiography, as you describe it, was perhaps something of a giant love-letter.